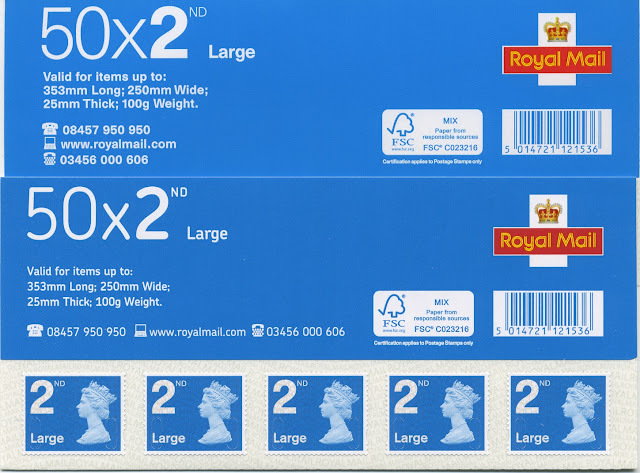 New Definitive Stamps, Booklets and Business Sheets. 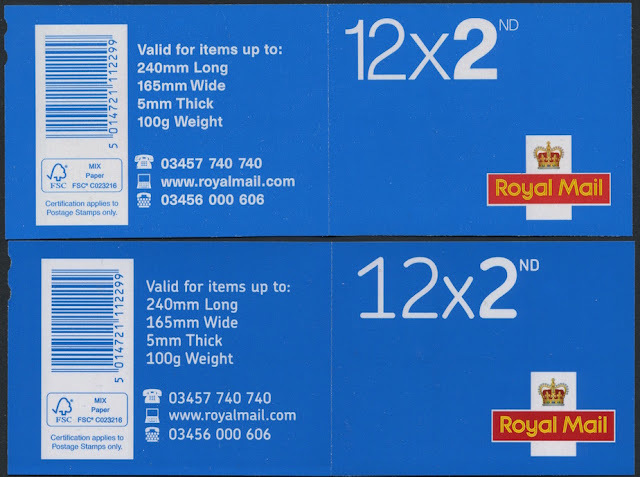 As mentioned earlier Royal Mail have decided to standardise the typeface/font used in their public communications, and this means that stamp products have to change to the Chevin* font. 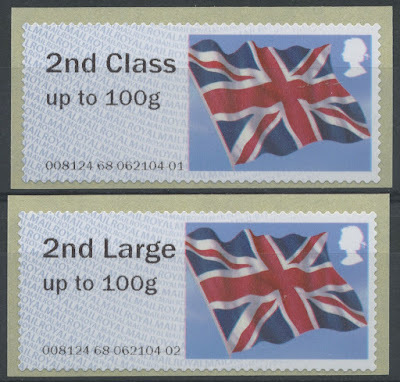 At the same time the colour of the 1st class and 1st Large stamps has been changed by the incorporation of 5% black ink to make the stamps darker, and closer to the 'Royal Mail Red' used elsewhere including on vehicles and postboxes. 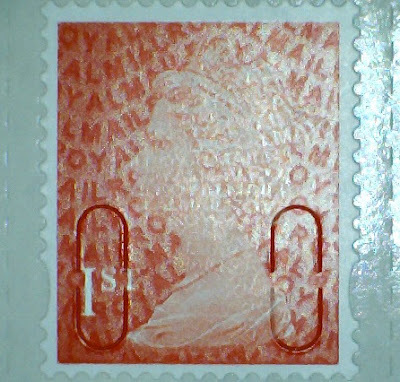 In Stanley Gibbons catalogues this colour will be called 'deep scarlet' although it is very similar to the rosine used for the 8p and 26p stamps. 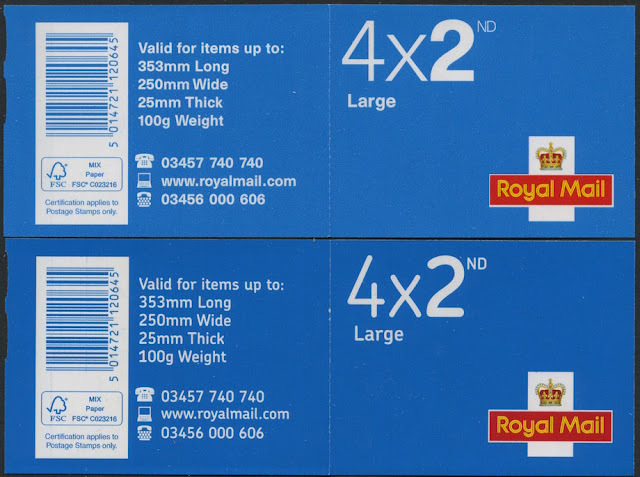 The new colour is also used for the booklet covers (which seem to have become more and more orange of late), including the Royal Mail cruciform on all booklets. * The Chevin is the name given to the ridge on the south side of Wharfedale in Leeds, West Yorkshire, England, overlooking the market town of Otley. 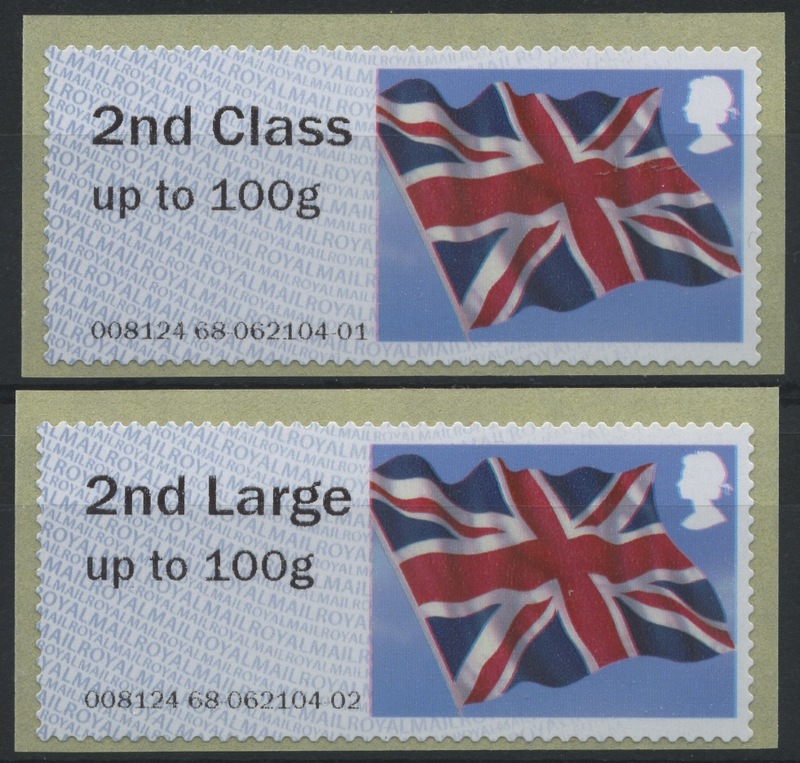 These images shows the new booklet below the old, the first class clearly showing a change in stamp colour, but also showing the change to the text. On the business sheets, not only have the font and red colour changed, the layout of telephone numbers has changed from three lines to one. All sheets are changed in the same way but I'm only showing the 2nd Large here. The fonts on the barcode and FSC certification remain unchanged in the international standard designs. 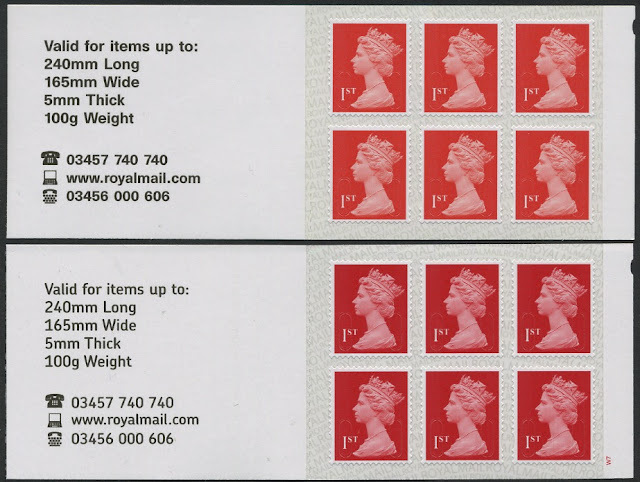 The colour of the 2nd class and 2nd Large stamps seems slightly darker than before but this is not deliberate so these stamps will not warrant new catalogue numbers. Totally new sheet stamps - we have been waiting for these for some time. 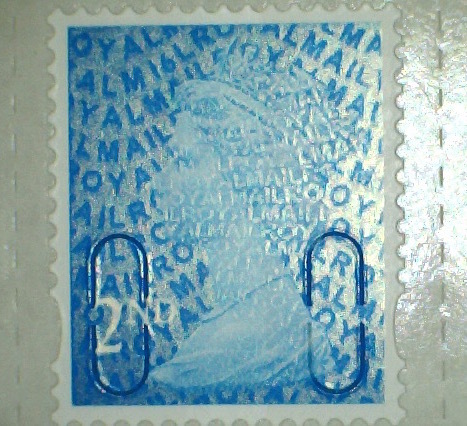 In addition to the July printing we understand that the 2nd class may have been reprinted in February, but we have seen no examples with this date. 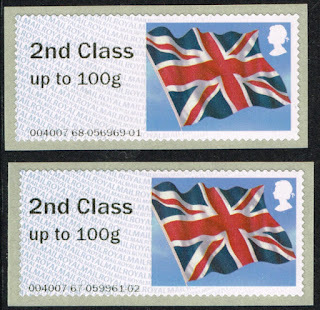 As the 1st and 2nd class counter sheets printed in the spring and summer have now been made available, and with Christmas stamps in post offices, it seems unlikely that counter sheets with the new dark red will appear any time soon. 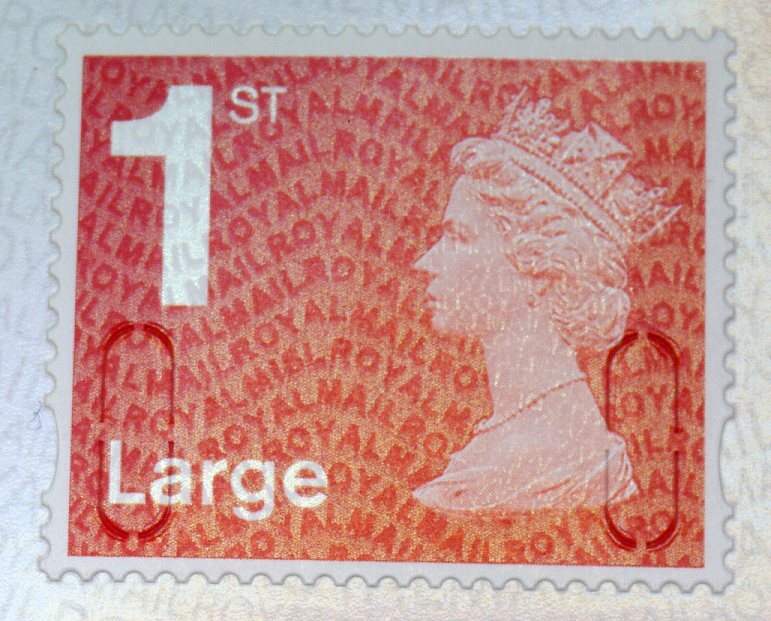 However, that does not mean that they have not been printed in 2016 so we may well see deep scarlet 1st class and 1st Large counter sheets with M16L codes early in the new year. 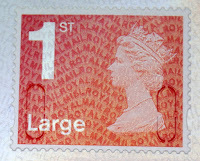 The Large stamps are more likely to appear first, though. This continues the series of Lunar New Year Generic Sheets Royal Mail has issued since 2012. 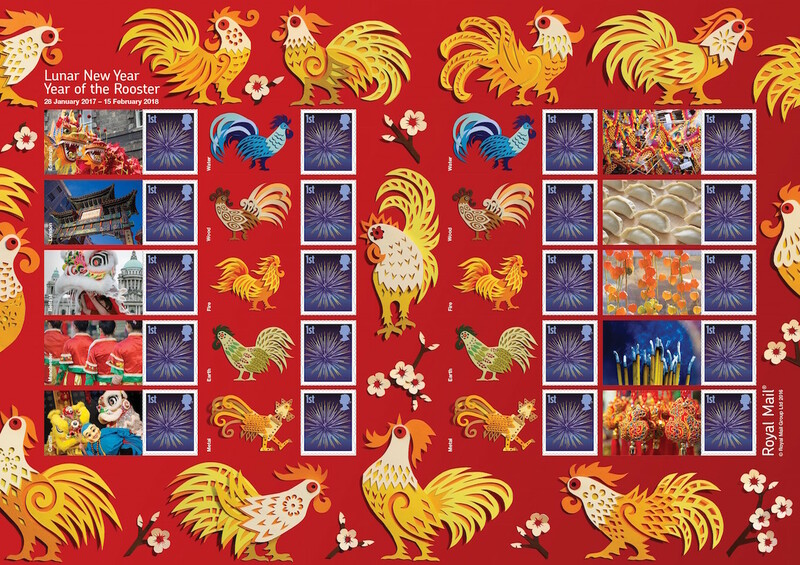 2017 is the ‘Year of the Rooster’ which runs from the 28th January 2017 to 15th February 2018. The sheet was issued on 15 November 2016, Royal Mail stock code AT095. the 12 animals featured in the Lunar New Year. Individuals born under this sign are likely to be observant, hardworking, confident, courageous, frank and honest." We will not be stocking this sheet. 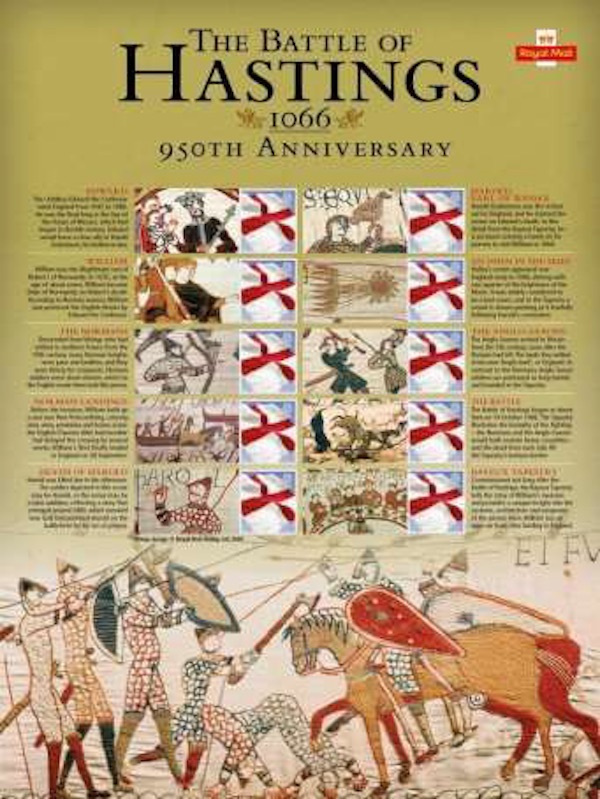 Battle of Hastings 950 years: just a pricey commemorative sheet and a pricier coin cover. Fifty years ago the General Post office marked the 900th anniversary of the Battle of Hastings on 14th October 1966 with a set of 8 stamps printed by Harrison and Sons using the latest technology available, in 9 colours and gold blocking (and phosphor). 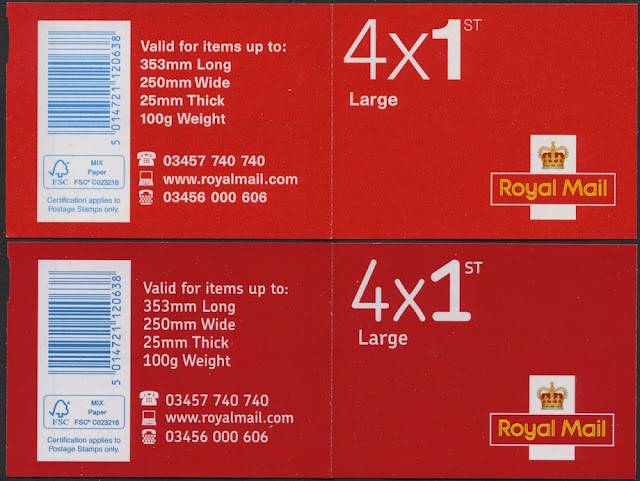 The set depicted scenes redrawn from the Bayeux Tapestry, and the 1st class (4d) value was issued in a strip of 6 showing a composite design. The Battle of Hastings was fought on 14 October 1066 between the Norman-French army of Duke William II of Normandy and an English army under the Anglo-Saxon King Harold II, beginning the Norman conquest of England. It took place approximately 7 miles northwest of Hastings, close to the present-day town of Battle, East Sussex, and was a decisive Norman victory. Issued on the anniversary of the battle 14 October, this year's offering from Royal Mail is one premium-priced (£14.99) Commemorative Sheet, also showing scenes from the tapestry, and an even more expensive cover containing a 50p coin - price £15.95. The wanderers return - with a lot of catching up to do! Greetings readers! 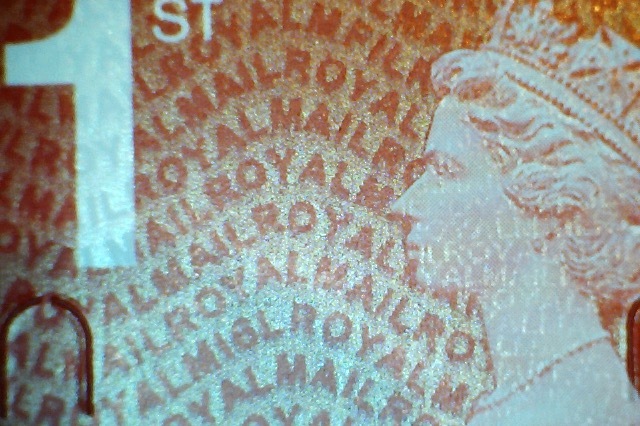 We're back, and floundering under a pile of mail and stamp news. First, a big thank you for keeping our (e-)mailbox relatively free over the last 11 weeks. Although I had access to the internet for much of the time, dealing with emails was made easy by the much lower volume than usual. 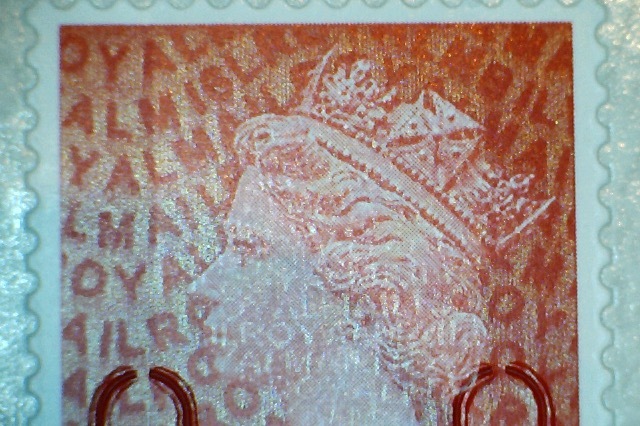 A possible new shade of the 2p sheet. Booklets of 12 and 4, and Business Sheets issued on 20 October have new cover/top-panel designs at least as far as the text is concerned (Royal Mail refer to it as a change of font, but some prefer 'typeface'). 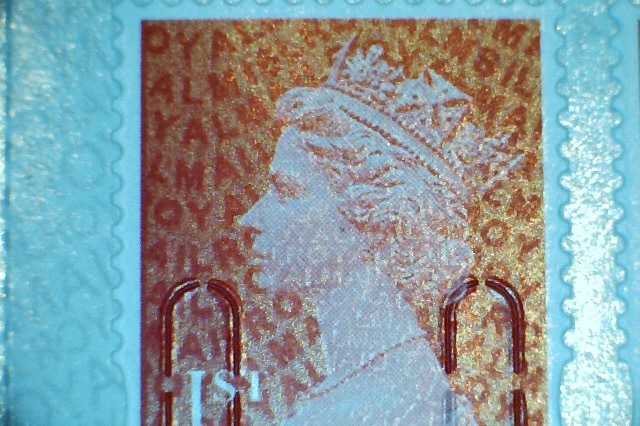 The 1st class stamps are also, intentionally, a darker red. 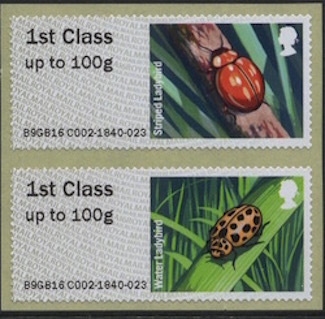 We have noticed over the last year or so that both the booklet covers and stamps have been creeping towards a more orange colour, so this will restore them to proper Royal Mail Red. So for 1st class and 1st Large there are new stamps, and new booklets; for 2nd class I don't think the stamps are different, so probably only whole booklets will warrant a new listing in catalogues. 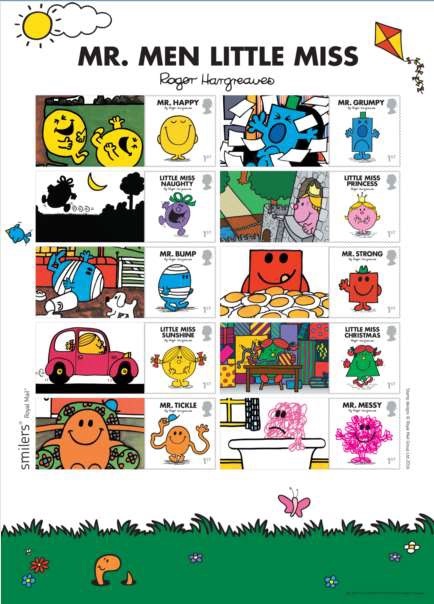 Also on the same day the 1st class red MCIL M16L made an appearance in the Mr Men booklet. Even without a darker colour this is new, because previous mixed booklet Machins this year have been purple. Trafalgar Day inscription in use 23 September - 23 October at Royal Navy (but not Submarine or Marines) locations. Poppy in use from most PO & Enquiry Office locations, and Museums 24 October - 13 November. Examples have been seen with the text and museum logo superimposed on the Poppy image. Machine A009 was installed at the Shakespeare Centre in Stratford-upon-Avon. Originally supposed to have the Symbolic Flowers stamps it seems Royal Mail discovered that the stocks were too low, and so this machine dispenses Machins and Flags. Apparently brisk first day sales resulted in reel replenishment and both undated and MA15 Machins were sold. 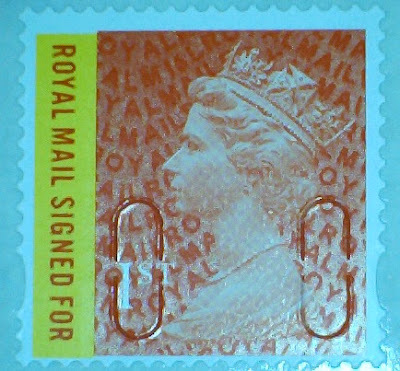 Machine A011 has been installed at the Royal Corps of Signals Blandford Forum, with the Mercury logo on the Machin stamps. 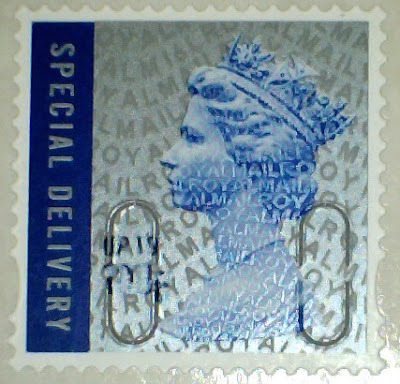 The BFPO HQ machine M001 includes the additional inscription Lest We Forget on the Poppy stamps. The Headquarters BFPO text overlaps the picture of the Poppy. Lastly, and not for the first time, a Post and Go machine (M007) was taken to the Party Conferences in September. In what I think is a change of practice the location was added to the text this year, Birmingham for the Conservatives, Liverpool for Labour, Glasgow for the Scottish Nationalists. I didn't spot any examples from the Liberal Party Conference yet. 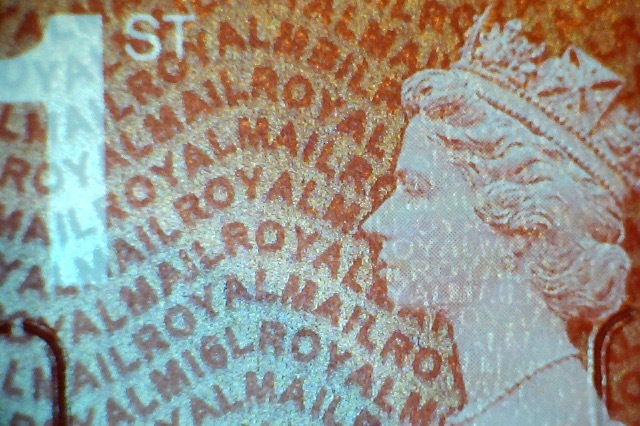 "Royal Mail is pleased to announce that machine M010 will go live at Norwich Enquiry Office from 17 November. The machine will carry the Hibernating Animals pictorial stamps. "Machine A003, located at the Fleet Air Arm Museum in Somerset, will carry commemorative inscriptions from 3 December to commemorate the first jet carrier landing. The Vampire jet, which made the landing, is on display at the museum. 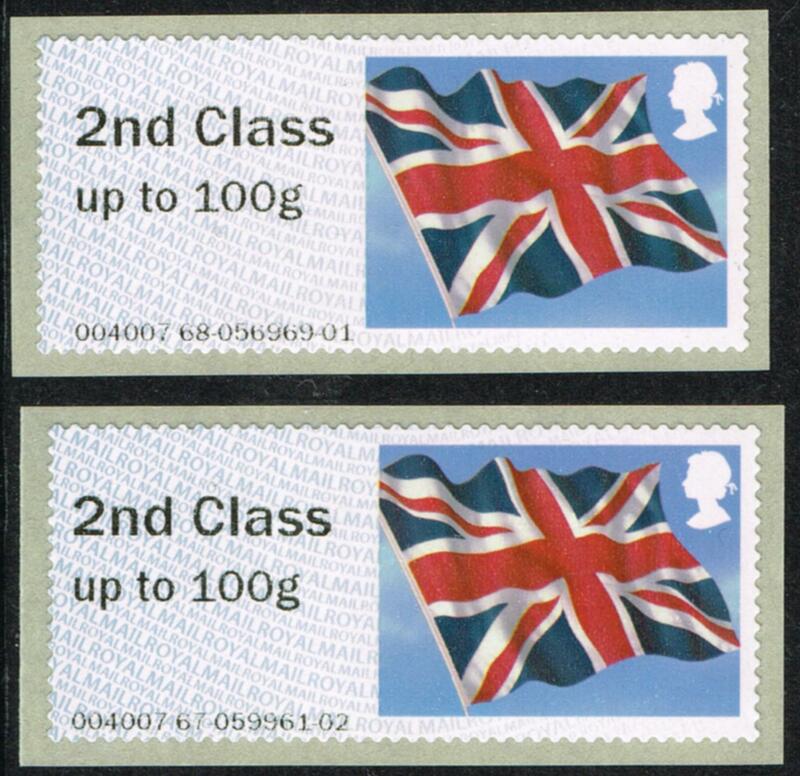 The Machin stamp will carry ‘LZ551/G 1st Jet Carrier Landing’ and the Union Flag will carry ‘ LZ551/G 03Dec45’. The additional inscription will be available until 3 January 2017." Meanwhile, the next post will be a little picture quiz to keep you occupied! To entertain you while I work through the news and stamps that will be the subject of more blog entries, here are some photographs from our holiday. The first three people who correctly identify more than 12 locations will get a prize, though I haven't decided what that will be yet! By the way, the locations are not in chronological order or geographical groups. #7 has not been identified by anybody - it's in North America. #15 has only been identified by two, it's in New Zealand, the whale being a clue but not of course exclusive. 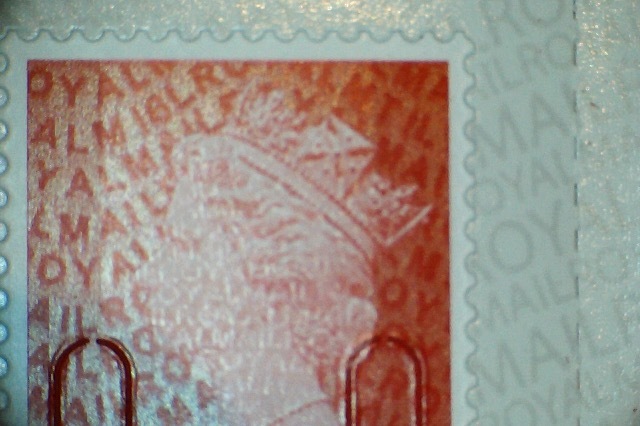 #14 also appears on a stamp! Other non-New Zealand locations are 3, 5, 10, and 12. 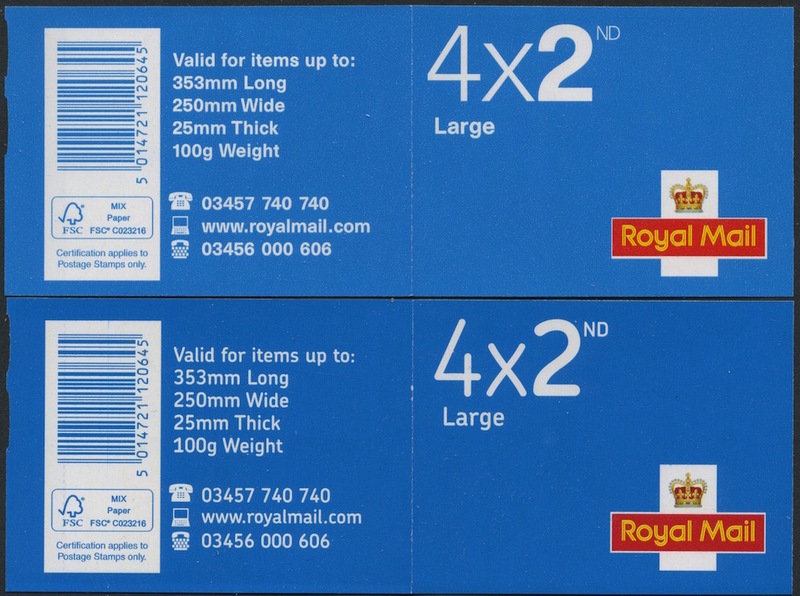 Answers by email to ian@norphil.co.uk - no comments revealing locations will be allowed! If it's too difficult, clues may follow.